The 185,000 square foot state–of–the–art facility includes a 25,000 square-foot Lighting Solutions Center, a 3,000 square-foot Lighting Solutions Lab, training rooms equipped with the latest audio-visual equipment, an amphitheater outfitted with multi-media webcasting capability, and complete dining facilities. From exterior lighting of the building façade, landscape, parking lot and interior lighting of office facilities, Hubbell Lighting wanted to make a statement that reinforced for anyone seeing the building for the first time that it indeed houses a lighting company. Secondly, they wanted to transform the building into a giant lighting laboratory, while making it inspiring and comfortable for those who work there. As a result, 4,567 individual lighting fixtures, and more than 150 different fixture types from all of its 16 brands illuminate the building, transforming the facility into a Greenville icon. When the building was in the planning stages, the code name for the project was “Starlight.” Visual Terrain, wanting to create a metaphor of the code name, uniquely illuminated the rotunda’s custom-designed reflector system, which also served as the exposed ceiling of the four-story edifice. As a leading manufacturer of energy-efficient lighting, the new Hubbell Headquarters is 30 percent more energy efficient than a typical office building of this size. Hubbell Lighting wanted “to practice what they preach.” The four-story, $41 million building is registered to achieve a Silver rating under the LEED (Leadership in Energy and Environmental Design) program of the U.S. Green Building Council. The employee cafeteria in the new Hubbell Lighting corporate headquarters in Greenville, SC is bright, colorful and multi-faceted. By day, it can feed the entire corporate facility staff of over 550 people. Through the use of sliding walls, the space can be changed to private dining rooms for smaller groups or additional training rooms for The Lighting Solution Center programs. In the evening, the space can be transformed to catered table cloth dining for everything from corporate group meetings to special events. 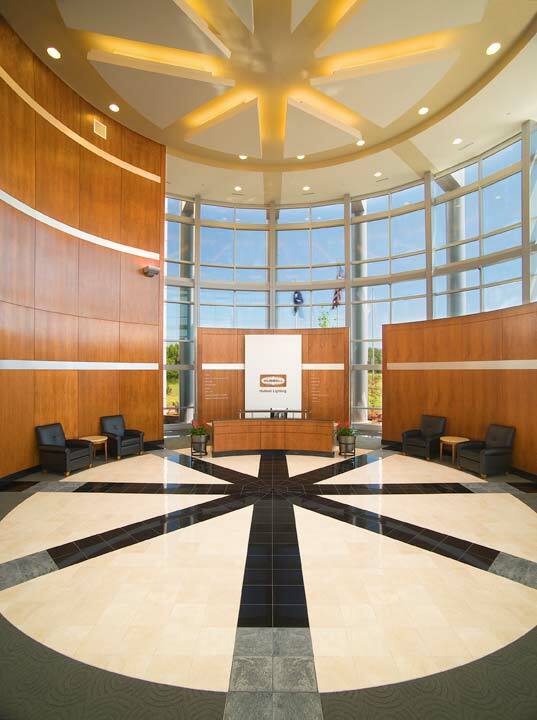 The main guest lobby/reception area in the rotunda entrance of Hubbell Lighting’s recently opened headquarters in Greenville, SC makes a powerful corporate statement. The multi-story lobby features surface-mounted accent lighting, recessed downlighting and daylight providing ambient illumination, and fluorescent cove lighting dramatically highlighting a starburst-designed ceiling treatment, which is also emulated in the grey and black tiled lobby floor.